Mutta adukk / Mutta madakk is an exclusive Malabar snack and is mainly prepared for the newly wedded groom or during Ramadan iftar . 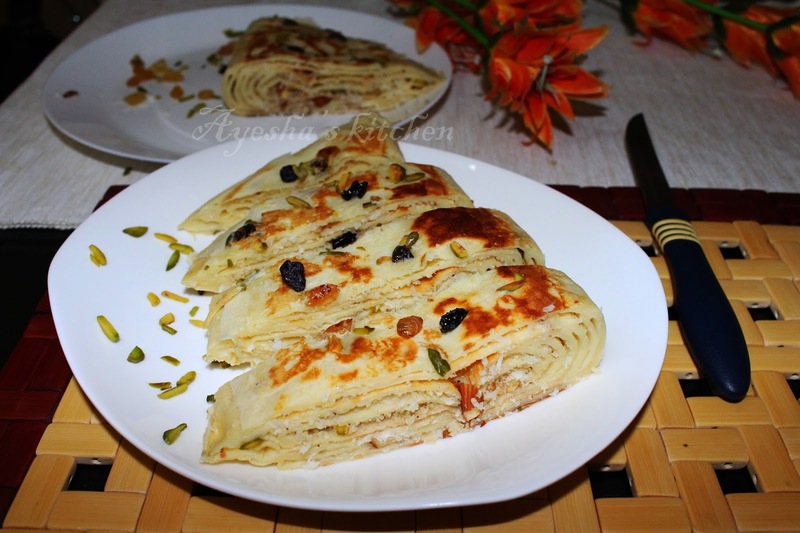 It is also known as Mutta pathiri or Sweet stacked pancake . Mutta adukk is normally prepared as a sweet snack . But can also make savory stacks or adukk. It is a very quick, rich tea time snack from gods own country, Kerala. The snack got its name from its ingredient mutta which means 'egg' and its preparation called adukku which means 'stacked'. So lets see how to make malabar special snack mutta adukk/ ramadan recipes / iftar snacks / snacks recipes / sweet snacks / ramadan sweets/ malabar dishes. Beat 4 eggs till soft. Now mix all purpose flour /maida slowly to it and beat again. You can also blend together in a blender. Make a thick batter and add cardamom powder, sugar and salt. Now pour 1 cup of milk to it, to make thin batter like neer dosa batter. For the stuffing, heat a pan and scramble the whisked egg (1, optional )with some sugar and when done set aside. Now dry roast grated coconut, chopped nuts and sugar until crisp. Mix it with scrambled egg and set aside. Heat a Neer Dosa chatti( cast iron appachatti) and apply some ghee evenly. You can also use fry pan. Make the flame to medium low, apply some ghee on the pan, pour the batter, swirl the pan to cover the whole pan. Put the sweet nuts filling on one side. Let it stay for few seconds. And press the edges , so that two layer get attached. 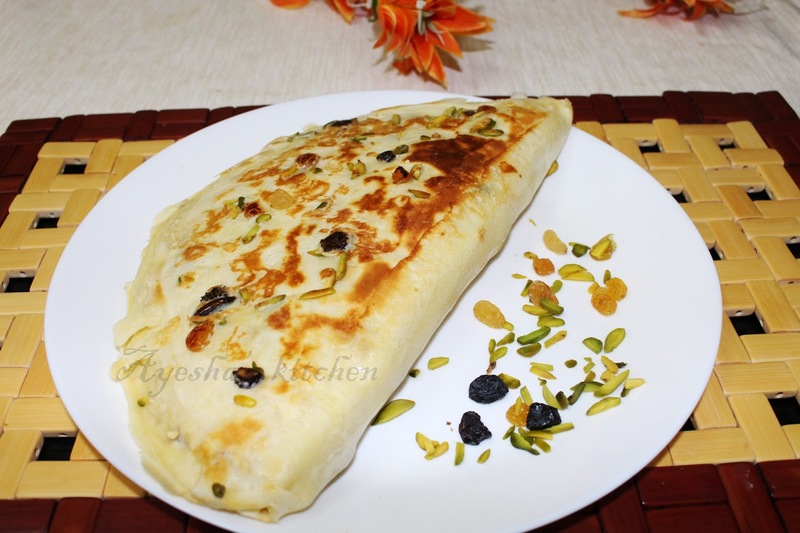 So apply some ghee on the right empty side and pour the batter in the empty right half side of the dosa chatti , with close contact to the middle of first layer. Add the fillings and keep it for some time. Next the empty side is left side. So pour on the left side with contact to the middle line , add fillings and turn to left side. Repeat until as much as stack or adukku you need. Do not leave the edges open. You can close the edges, by pouring few drops of batter on the sides. Press gently with the spatula. Once cooled, cut into small pieces.